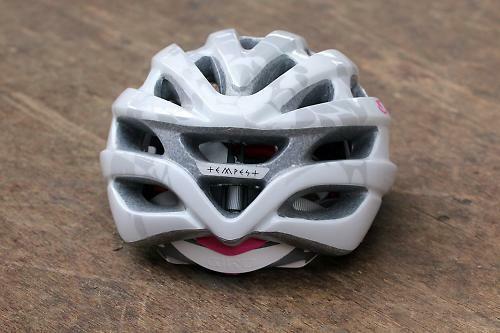 The Giro Tempest bills itself as a child's helmet with adult features. It is easy to adjust in all directions and looks more mature than its years. As a parent, one of the longstanding problems with fitting children's helmets is the struggle to get the chin strap tight enough without clipping your child's skin at the same time. Giro have used a ratcheting buckle that's found in several newer children's helmets on the Tempest. This neatly does away with the worry. You can hear it click reassuringly into place and adjustment is easy and pain free. A pad would have been a nice touch to cushion skin from plastic. Additional size adjustment is available using the side clips. Again these are very easy to use with a click into place system which has only recently begun to filter down from expensive adult helmets. At the back of the helmet there is a dial adjuster. With a range of 50-57cm both our 8 year old and 12 year old testers fitted this lid. The overall dimensions and design (no fins or peak) make the Tempest seem smaller and therefore more proportionate on a child's head than other helmets we've tested. Padding is pretty minimal for the cost of the helmet, with only two pads on top of the head and one quite thin pad around the forehead. Our tester did not complain about any loss of comfort but I felt this was an area that could be improved, especially as we are getting towards the sweaty summer ride season. Twenty-two vents and an insect net put this lid in the higher quality bracket of children's helmets. A small reflective decal adds an additional safety feature to the helmet. The effect of this is pretty minimal and further decals would not have detracted from the helmet's overall look. Available in quite 'grown up' colour schemes (black with detailing, ruby red, camo and our tester's silver on white), this gives your child options away from the usual bright pink or cartoon characters if that's not their thing. Overall, the Tempest closely resembles a mid-range adult helmet with child-sized proportions. When a little rider wants to wear what the big riders have on, the Tempest™ can help. This helmet features the same style and technologies found on our adult range, like the ease of Universal Fit™ sizing and one-handed adjustability of the Acu Dial™ system, and the rugged durability of In-Mold construction. And with plenty of ventilation to keep kids cool the Tempest™ is a sure, comfortable choice. No worries with this well-respected brand. Thankfully, not tested in an accident situation. Lighter than several other offerings for children. Minimal padding but chin strap ratchet brings the score up. At the more expensive end of youth helmets, but this is reflected in the features. The proportions - it doesn't look oversized on a child's head. Muted colours - unusual in a child's product.